Submissions are now being accepted for Edge Fest 2019. Seven selected plays will receive two full productions as part of Edge Fest on Friday, May 24th and Saturday, May 25th. The Birdhouse Judge’s Award ($100) and Audience Choice Award ($100) will be announced Saturday, May 25th following the final production. 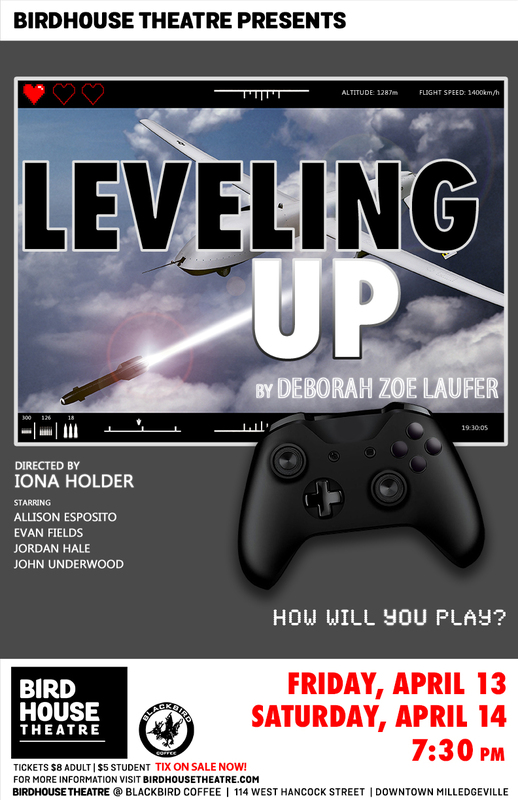 Plays with a previous production preferred, but not necessary (staged readings included). Sorry, no musicals. There is a $5 submission fee. The seven selected plays will be announced in mid April. 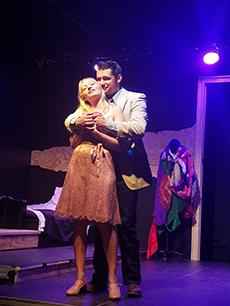 The seven selected plays will receive two full productions, consideration for the Birdhouse Judge’s Award ($100) and the Audience Choice Award ($100). Playwrights will be provided with production photos and possibly video. Playwrights are encouraged to attend the festival, but attendance is not required. 3) Attach the play to the email in PDF, DOC or DOCX format as a BLIND SUBMISSION. 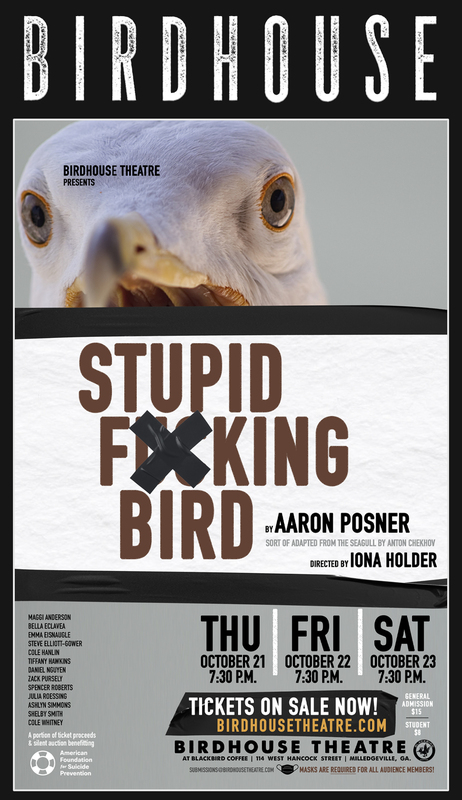 The attached play must be free of any identifying information and/or contact information, including the cover page. The file should be titled the name of the play only, without any spaces or other identifying information (PlayTitle.pdf or PlayTitle.doc). 4) DEADLINE is Friday, March 15, 2019 by 11:59 p.m. EST. and MUST be accompanied by submission fee of $5.00 USD. 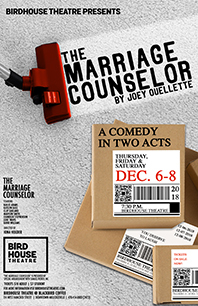 We are pleased to announce tickets are now on sale for The Marriage Counselor. You deserve a good laugh and so does someone you love. 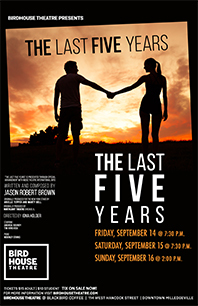 The Last Five Years tickets are now on sale. Edge Fest 2018 is this week! 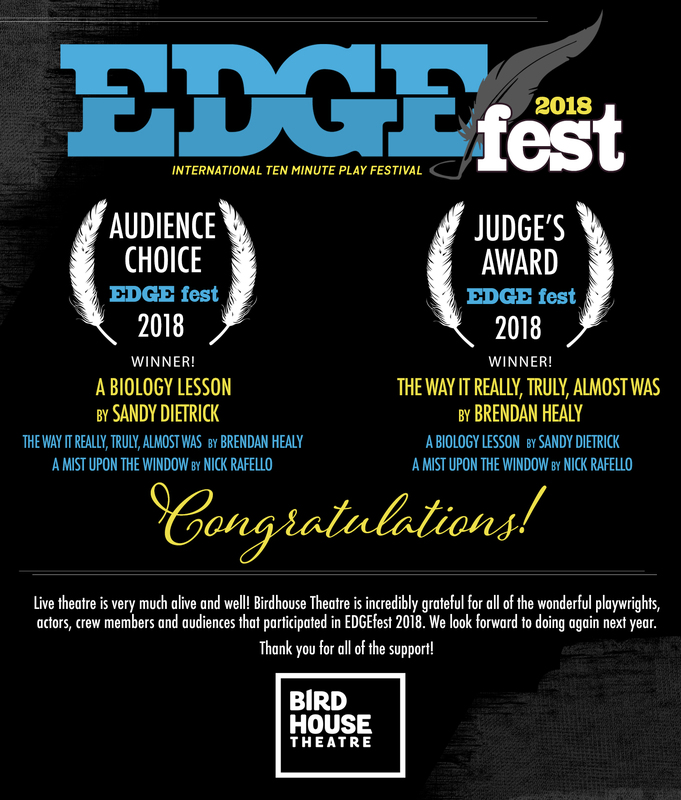 We are pleased to announce, The Edge Fest 2018 selected plays. 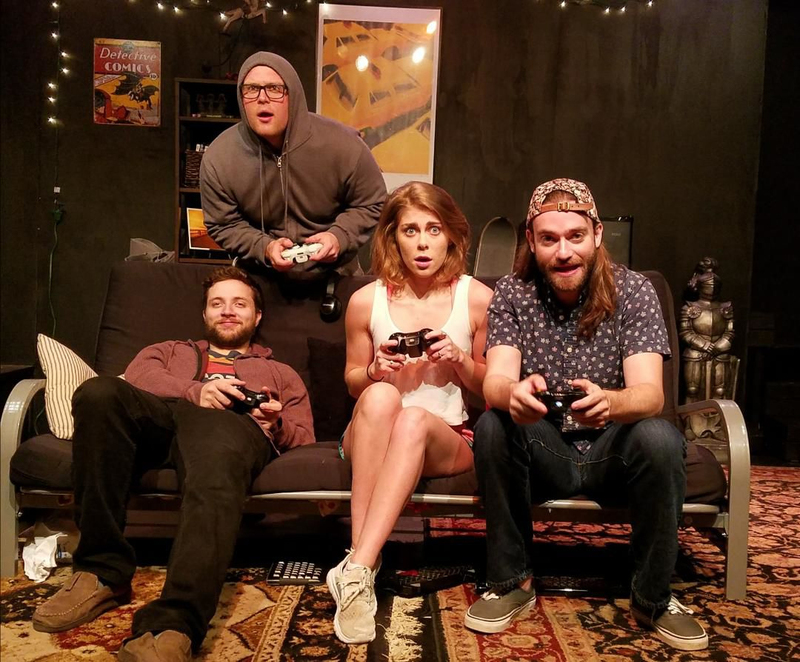 The Edge Fest Eight will receive a full production on Friday, May 25 and Saturday, May 26, 2018 at Birdhouse Theatre. Check out The Union-Recorder's article here. We are pleased to announce Edge Fest 2018! Seven selected plays will receive two full productions as part of Edge Fest on Friday, May 25th and Saturday, May 26th. The Birdhouse Judge’s Award ($100) and Audience Choice Award ($100) will be announced Saturday, May 26th following the final production. The seven selected plays will be announced in early April. 4) DEADLINE is Saturday, March 10, 2018 by 11:59 p.m. EST. and MUST be accompanied by submission fee of $5.00 USD. Congratulations to our 2017 Edge Fest Winners! 3rd - Gospel According to Bowser by Dan Borengasser. EdgeFest 2017 is this week! -Checkout Broadway World Atlanta and their article about EdgeFest. -Meet Our 2017 Playwrights here. 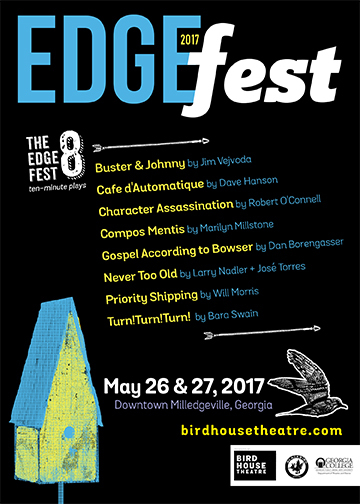 Birdhouse Theatre and Edge Fest 2017 are thrilled to announce the eight selected plays for production on May 26 and May 27. We are pleased to announce Edge Fest 2017! Seven selected plays will receive two full productions as part of Edge Fest on Friday, May 26th and Saturday, May 27th. The Birdhouse Judge’s Award ($100) and Audience Choice Award ($100) will be announced Saturday, May 27th following the final production. Plays must have had a previous production, staged readings included. Sorry, no musicals. There is a $5 submission fee. The seven selected plays will be announced in earl April. The seven winning plays will receive two full productions, consideration for the Birdhouse Judge’s Award ($100) and the Audience Choice Award ($100). 3) Attach the play to the email as pdf or in word as a BLIND SUBMISSION. .pdf or .doc are the only formats we accept. 4) DEADLINE is Wednesday, March 15, 2017 by 11:59 p.m. EST. and MUST be accompanied by submission fee of $5.00 USD. What an amazing weekend! The reviews were great and the audiences were wonderful! We are proud to announce our winners. 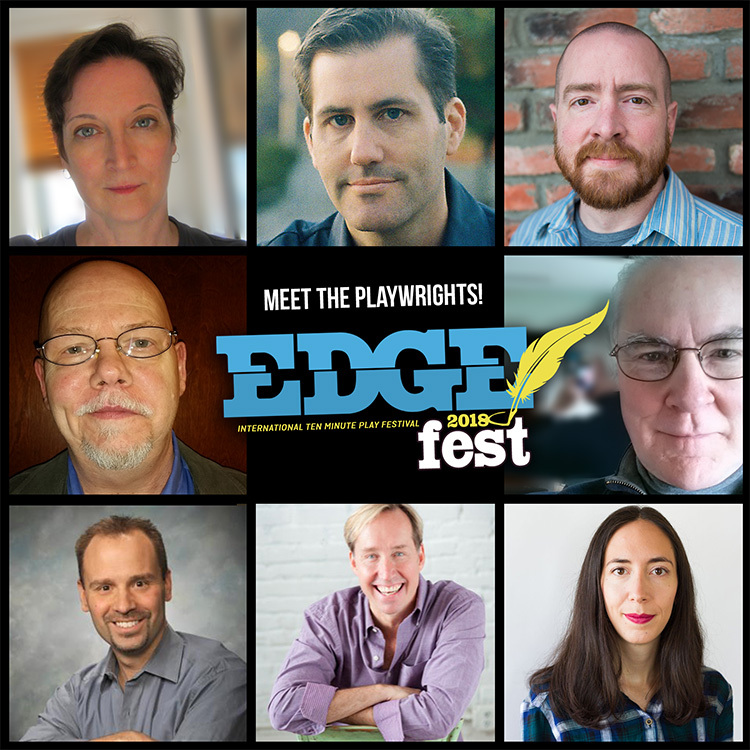 Learn all about our selected Edge Fest playwrights. 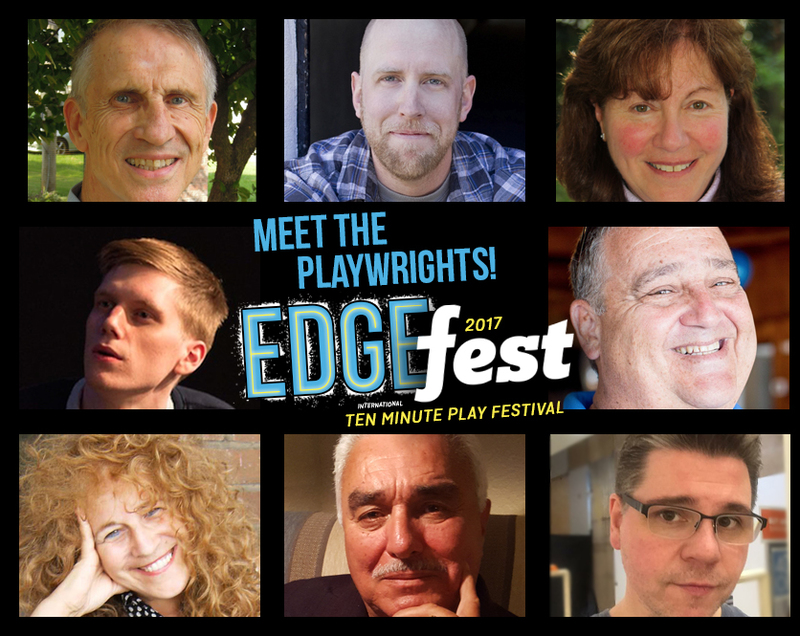 EdgeFest Full Cast Announced! EdgeFest Theatre Announced. Visit the EdgeFest page for all the info. Congratulations! 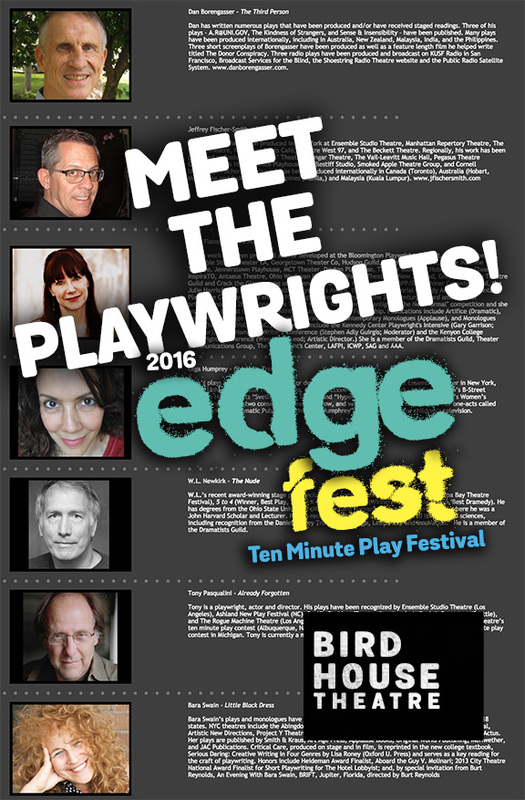 The 7 Selected plays to be performed at Edge Fest 2016 will be announced later this week. Thank you to everyone who submitted. Our decision was difficult with the abundance of rich plays. The future of theatre is alive and well! The submission window for Edge Fest is officially closed. Thank you to everyone who submitted. We are looking forward to reading everyone's work and hope to be making announcements by April 15, 2016. For more submission opportunities, visit PlaySubmissionsHelper.com/blog for a list of tons of contests and other play submission opportunities. We are pleased to officially announce Edge Fest 2016! Seven selected plays will receive two full productions as part of Edge Fest on Friday, May 27th and Saturday, May 28th. The Birdhouse Judge’s Award ($100) and Audience Choice Award ($100) will be announced Saturday, May 28th following the final production. Plays may have previous productions, but unproduced work is preferred. Sorry, no musicals. The seven selected plays will be announced by Friday, April 15th. 4) DEADLINE is Tuesday, March 15 by 11:59 p.m. EST. and MUST be accompanied by submission fee of $5.00 USD.